Liza Shtromberg loves jewelry designs that, like her, embody modern multi-culturalism. Born in Moscow and raised in both Russia, where her father was an accomplished stone cutter, and then in a small port town in Israel, she immigrated to Los Angeles with her family when she was 16 years old. As a trilingual child, she first began experimenting with jewelry design by creating molds to cast jewelry in her father’s jewelry gallery in the old quarter of Jaffo, Israel. But as a culture-curious kid at Hollywood High in the ’80s, it was the raw materials to which she was drawn. So as a teenager, she switched to wire-work, stringing Native American peyote beads and crystals, and sold her designs on the streets of Los Angeles. Liza’s fascination with jewelry design comes, in part, from a deep respect for what the craft has meant over the millennia. Throughout history, and across cultures, jewelry has been an integral part of the human experience. We’ve been adorning our bodies with raw materials, from bracelets made of woven grass and bits of shell, to lab-grown diamonds, for hundreds of thousands of years. Jewelry is more than an accessory, it tells our stories: It’s a religious token, a treasured family heirloom passed down from parent to child, a glittering status symbol, a currency, a memento, a talisman, an expression of love. Ultimately, jewelry is an expression of self. 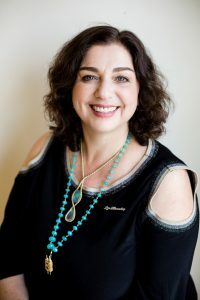 With this in mind, Shtromberg helps her clients personalize their selections, mixing and matching elements from her different collections to help them “find themselves” through her jewelry. Though Shtromberg has a loyal clientele of both stylists and celebrities, and her jewelry appears on popular shows such as The Voice, Crazy Ex-Girlfriend, How to Get Away with Murder, and others, she rejects a trend-centered approach to designing. Rather, her jewelry is meant to be organic, timeless, and “playing into who you really are,” she says. Each collection is strategically designed to layer well with the others – as well as with jewelry the client may already have. And with new collections coming out on a regular basis, there’s no shortage of options. So venture into the exotic and bedazzling world of Liza Shtromberg. Let the stones transform you and transport you beyond the horizons you know. After all, your jewelry isn’t just an accessory, it tells your stories: Relationships, anniversaries, accomplishments, beliefs, celebrations, gifts, milestones, travels, and personalities. Liza Shtromberg Jewelry is here to help you curate your journeys.